Sailor Venus is the leader of the Sailor Soldiers from the series Sailor Moon, together with the other Sailor Soldiers she fights against the forces of darkness in order to protect the Silver Crystal. Minako Aino is Sailor Venus's true name and she dream is to become an idol. Sailor Venus is the first S.H. Figuarts I've owned and honestly I have to say that she is not up to the same standard as a figma. Though her design is pretty character accurate and appealing the eye there are a few places which make her a slight disappointment. Firstly her paint work isn't great as there were a number of places with dark marks, most I could remove with some nail polish remover however on one section of her hair this didn't work. However I do like the use of pearlescent paint. 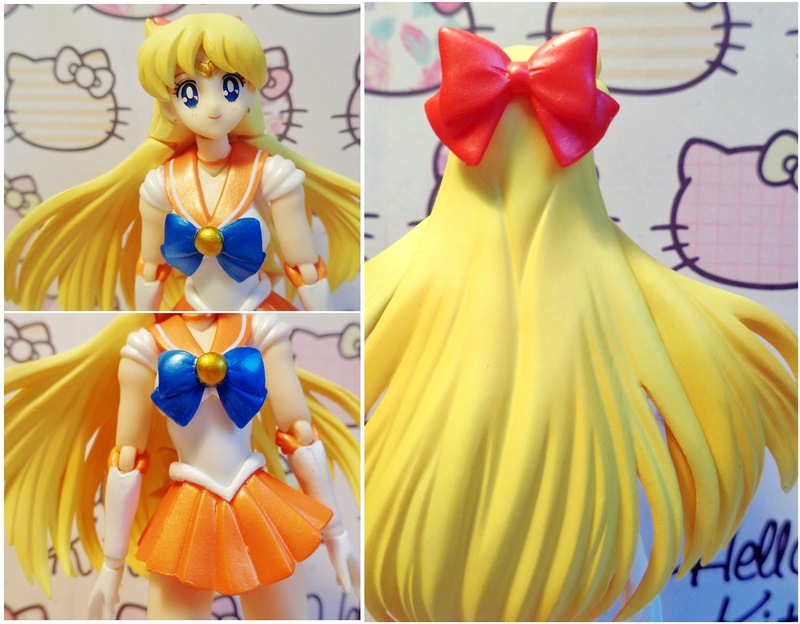 Regarding sculpt I have one complaint which is that the top of her glove is cut away in order to fit the joint, I don't understand why they did this as all the images I have seen of Sailor Venus has the orange all the way around. From the back the elbow joint is covered by the orange which maybe the reason behind the choice but once again I ask myself why because most of the time you are going to be viewing the figure from the front and it just looks odd. What makes this even worse though is that at the elbow the joint allows no rotation which not only stops the lower arm from moving as it naturally would but it also means you can't do anything to hide it. Apart from the arm for the most part her articulation is good with articulation at the head, shoulders, elbows, chest, waist, thighs, knees, ankles, wrists, and extra articulation in two sections of hair. One joint of note is the thigh joint which is a ball and socket, swivel, and hinge joint all in one, the hinge I believe is to give figures greater leg movement forward and back, however I my joints are rather stiff and as the joint can move so many different ways it feels like I am forcing it and possibly breaking it whichever way I move it. 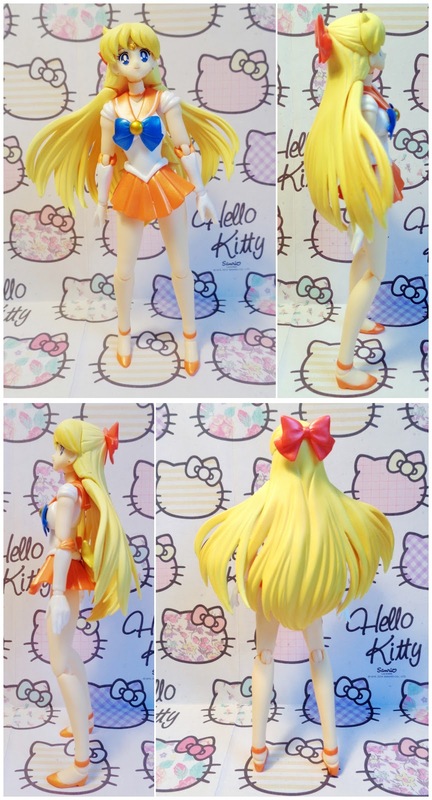 Plus I do not see why Sailor Venus needs the extra drop down hinge as her skirt is so short that her leg can move all the way forward and back using just the ball and socket part of the joint. Firstly I will quickly mention her standard pieces, as it is my first S.H. Figuarts review. A stand is provided, which is personalized to the character. One thing of note is that the stand uses only a claw piece to hold the figure as there is no hole in her back. This would normally be fine but the claw is designed as such that it is rather frustrating to use and hard to get a firm hold on the figure. Her second accessory is Artimus her companion, who along with Luna aids the Sailor Soldiers. Artimus is very cute but once again some dark marks on the tail, which when I tried to remove with nail polish remover also removed the white paint revealing the semi-transparent white plastic below, also this cat is very tricky to get standing on his own. He is articulated however with a head and a tail that can rotate. As for face pieces she comes with a happy face as default, an open mouth happy face, an angry face, and a battle cry face. 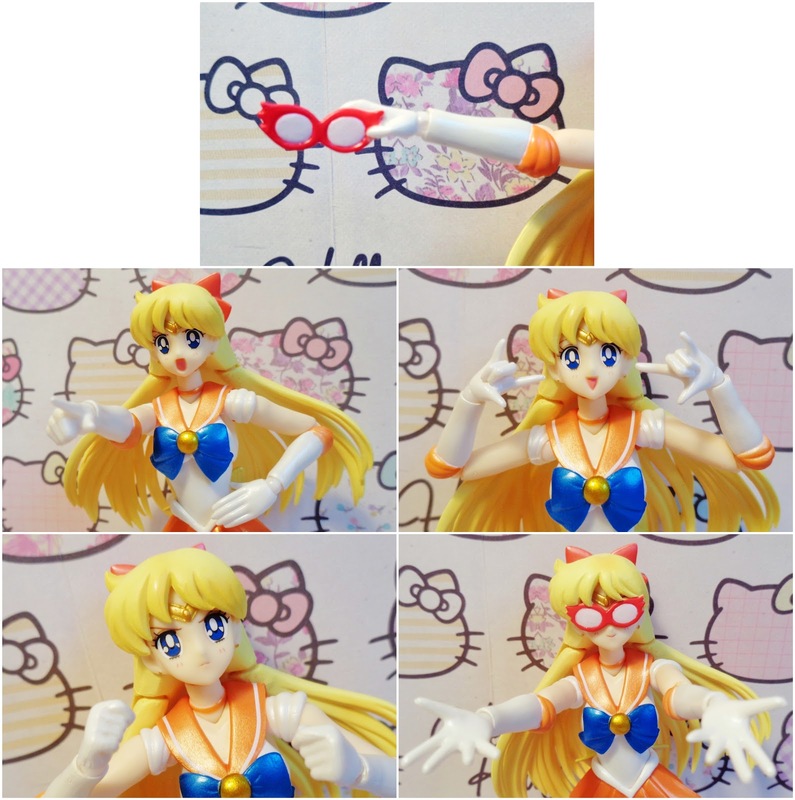 She also comes with relaxed hands as default, a pair of fists, open hands, a pair of Sailor pose hands, a pointing hand, another Sailor pose hand, and a hand holding her Sailor V glasses. Then lastly she comes with an alternative fringe piece with her Sailor V glasses attached. Over all despite a few negatives I do still enjoy this figure, perhaps it is her colour scheme, orange and yellow are just so happy. If you are not a fan of the series, like me, I would probably say give her a miss, however if you are then you should definitely pick her up and the other Sailor Soldiers as at this stage these are the only articulated renditions of the characters. Now the big question for me is whether or not I will try S.H. Figuarts again and at this stage my answer is yes, I am willing to give them another try, but they will have to really step up their game if they want me to choose their renditions over the figmas.